Iskandar Investment Bhd, the catalytic project developer of Iskandar Malaysia, has secured a RM1.8 billion real estate investment from China-based company, Qingdao Zhouyuan Investment Holdings. Qingdao Zhouyuan is a subsidiary of Hebei-based real estate developer, Zhouda Real Estate Group. President and Chief Executive Officer Datuk Syed Mohamed Ibrahim said the investment project, over two phases, will commence next year and be over a period of about 10-15 years. "This is the first real estate investment by a foreign company in Medini Iskandar Malaysia and the biggest project investment in the area, to date," he added. He was speaking to reporters after signing two framework agreements with Qingdao Zhuoyuan for the development of mixed residential and commercial projects in Medini Iskandar here, today. 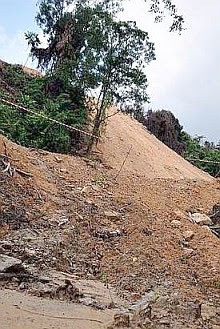 All too familiar : The earth works on a slope near Jalan Senjolong, Cheras, has raised concerns among nearby residents. RESIDENTS of Taman Pertama, Taman Cantik and Taman Bukit Ria in Cheras, Kuala Lumpur have expressed their concern over a nearby development on a hill near Jalan Senjolong. They have noticed some earth works and land clearing being carried out on a Class 3 slope. The development on the 0.809ha land will see luxury condominiums being built next to a forest reserve near Pudu. The development order had already been issued by KL City Hall (DBKL) some years back. The project is due to be completed in three years. A meeting was held with some concerned residents together with the developer, DBKL representatives and Cheras MP Tan Kok Wai. Issues raised by the residents include the use of residential roads by the lorries carrying construction materials, safety and security — as the development is located on a hillside — and, protection of the environment. Tan also raised a few issues like the use of the access road from Taman Kopena, signboard indicating development, the use of reinforced concrete wall and a topography map and monitoring of the slope. “Residents are feeling uncomfortable and unsafe because of the slope works being carried out at the site. “They are already aware of many hillside tragedies, so they don’t want an unfortunate incident to occur. “Assurance is needed because the local community have been informed about what is happening,” he said. According to the developer Orando Holdings Sdn Bhd, a 20.1m-wide road will be built from the site leading to Pandan Perdana. He added that they had adhered to all the regulations and building guidelines before obtaining the development order. It was mentioned that silt traps would be built after earth works and clearing were done to divert water into temporary drains. This will ensure that any erosion caused by the water can be discharged properly. After a series of discussion, the developer agreed to gather all the relevant materials pertaining to the development to be scrutinised by Tan and the community. PETALING JAYA: Kimlun Corp Bhd is moving into property development, and is buying nine parcels of land totalling 17.3ha in Negri Sembilan for RM27.36mil cash. The engineering and construction services provider told Bursa Malaysia, the move was in line with the group's strategy to go up-stream into property development.